RGB lighting isn't for everyone, but if you happen to be partial to a bit of illumination, there are good reasons to keep within a particular manufacturer's ecosystem. Synchronised colours and effects become a whole lot easier, and Asus has been using its established Aura Sync ecosystem to offer consumers a one-stop shop for harmonious lighting. 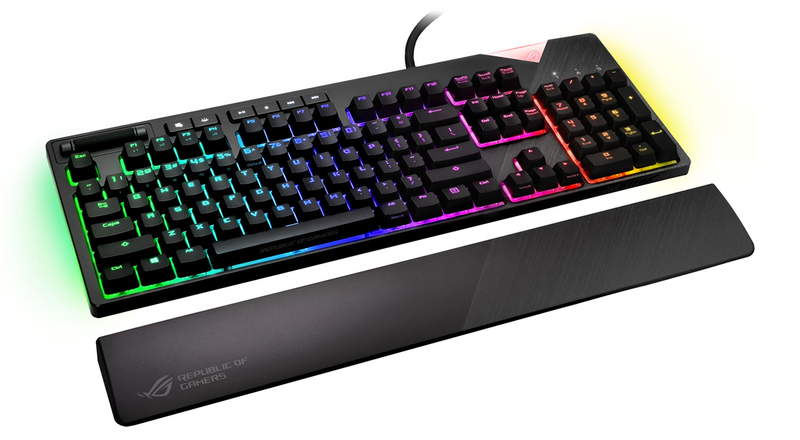 A price tag of £150 may seem steep at first glance, however this appears to have become the going rate for a full-size gaming keyboard with Cherry MX switches and RGB lighting. 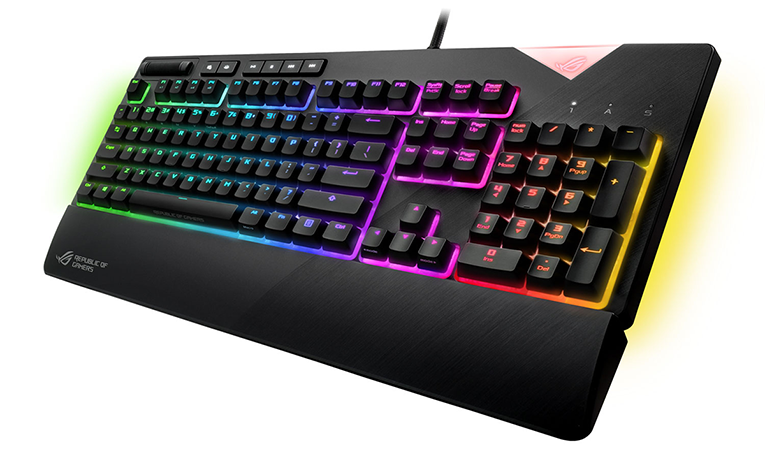 Similarly priced rivals such as the Corsair Gaming K95, HyperX Alloy Elite and MSI Vigor GK80 are all competing in roughly the same ballpark, yet while there's no shortage of choice, the ROG Strix Flare does stand out courtesy of a rather stylish aesthetic. The paintwork on the keyboard and palm rest is a dark matte grey that's still lighter and smoother than most alternatives, giving the Strix Flare a sleek overall look, while slightly darker keycaps and a white underlying tray provide good contrast. Dimensions of 454mm x 155mm x 31mm make the unit a tad larger than most, and if you're struggling for desktop space, do note that depth increased to almost 220mm with the palm rest attached. Connecting said palm rest is hassle-free - a couple of notches help secure it to the keyboard - and rubber pads on the underside ensure it stays in place. Similar rubber pads feature on the main unit, and two extendable feet toward the back are suitably rigid when in use and also rubber-tipped for stability. We like the overall look and feel, but while the smooth exterior is easy on the eye, we'd like at least some form of texture on the palm rest for extra grip. Asus's chunky keycap font isn't quite as elegant as, say, the HyperX Elite, but provides more of a gamer look and feel. Illumination, however, is a strong point. The per-key lighting is bright and even, light bars on the undersides help spread the glow further, and the acrylic ROG badge toward the top-right corner is a nice touch. 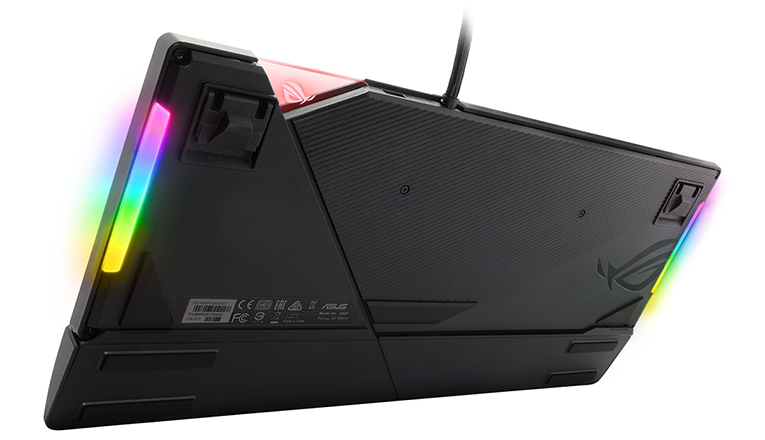 What's handy is that the badge is removable, and Asus includes a blank acrylic piece in the bundle, allowing you to apply and install a clan tag or emblem of your choice. Another interesting tweak is that Asus has moved the volume roller and multimedia keys from the top right to the top left. The theory is that the controllers are closer to the hand while gaming, and should be usable without having to let go of the mouse. 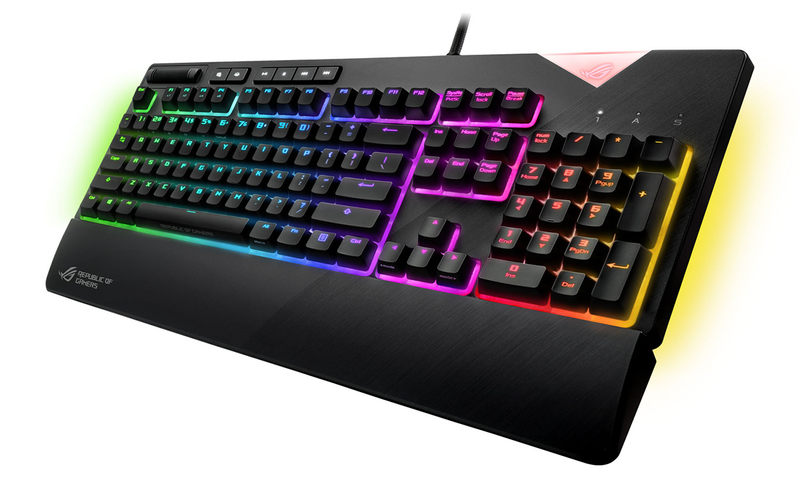 It's a good idea, but there's a learning curve involved - I've become so accustomed to having the volume roller in the top right on other keyboards that the Strix Flare took some getting used to. After the adjustment period the arrangement makes sense, and I like the fact that the volume roller can be clicked to mute. The key arrangement is sensible - don't worry about the pictured layout, UK models do ship with a double-height Enter key - however the plastic construction isn't as robust as metal-topped competitors. You don't notice any movement during regular use, but if you push firmly near the centre of the keyboard there is a certain amount of flex; I happen to have the HyperX Elite on my desk as a daily driver, and pressing that reveals no flex at any point. The choice of construction material ought to be better on a £150 keyboard, though as expected there's no faulting the ubiquitous Cherry MX mechanical key switches. A choice of red, brown, blue or black switches will be available depending on regional, and our red review sample provides that familiar linear action with no audible click, 4mm of travel and actuation at 2mm. You can't go wrong with the key switch, and the Strix Flare offers familiar features elsewhere. These include a 2m braided USB cable, onboard memory for storing profiles, 100 per cent anti-ghosting, N-key rollover and a single USB 2.0 passthrough for connecting another peripheral. 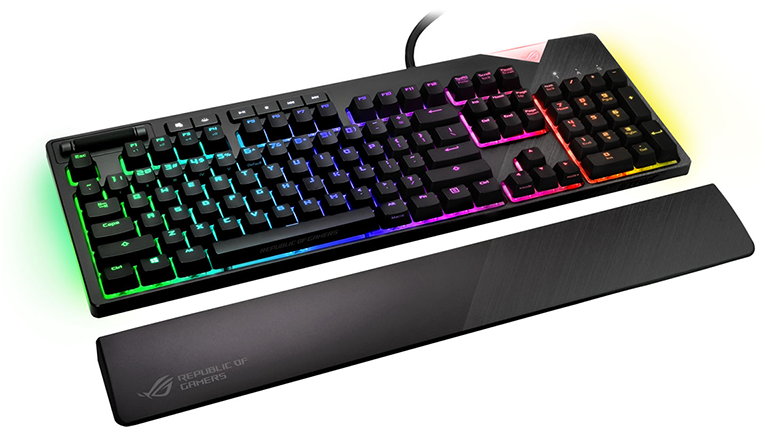 The extra port always comes in handy, yet for this amount of money we'd hoped to see USB 3.0 featured as standard, and if you prefer to use contoured keys for the WASD area, it's worth pointing out that Asus doesn't include any optional keycaps in the box.